Many use item. Convenience galore. I reordered and gave all my grown children one as a gift. 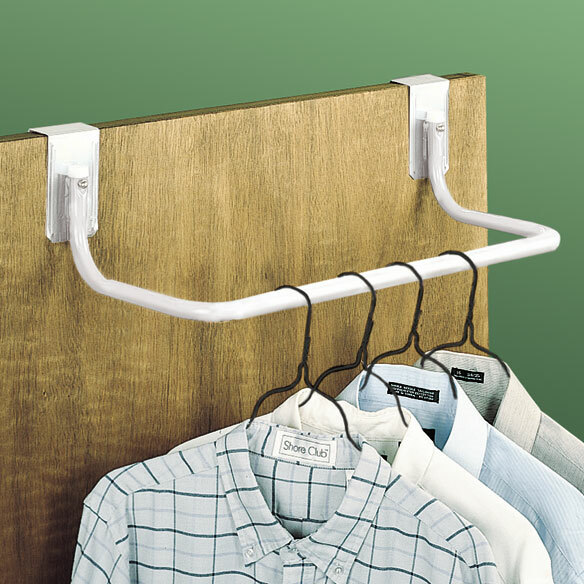 Very handy to use for a GUEST ROOM and then stores easily. Handy use near the dryer when hanging shirts or jeans. Will hold a lot of weight. A bedspread can be stored on it also. The best thing that has been invented. Hanging my clothes out the night before. Gets me ready me ready for church on time because my clothes are already out. I use this nearly every day. I take clothes out of the dryer, hang them on the hanger and then on the over-the-door closet rod. I can hang clothes that I am not using for another season. It is a great product. a must for guest room.keeps guests out of the closet. really like this product.good place to dry shirts too Guests can use this instead of going in closet. Smaller than shown on door, not made well and left marks on the door. We need this item for almost daily use. I needed something in my utility room to hang clothes as I took it out the washer to air dry. Because I need extra hanging space. Like to have my wardrobe ready in the a.m. I went to your site for this originally. I have one from many years ago that has served me very well, and need a second one. The one I have is longer, but that seems no longer available. My doors are 1 1/2 inches thick. When I do laundry I need a place to hang items. It is hard to find anything that will fit these thick doors. I purchased 2 of them. This item is invaluable when taking clothes out of the dryer and wish to immediate hang until ready to take to closet. It's also grear for clothed that need air drying first. Easy access for commonly used items. Hope to use in laundry room for drip drying! The extra room for hanging clothes is awesome, and they are hidden from view. I have a similar over the door clothes rod that I have had for years. My sister has moved to a new house and was visiting me and said that she needed a rack like mine for her utility room. I am purchasing this one for her. Great Idea for Sebiors. I love your catalog. Need for my grandson's door. Handy for setting aside packing choices. I live in a one bedroom apartment. always in need of these. I can always use the extra space this item would provide. To hang clothes from dryer. Need extra hanging space. Doors r white and it looked the strongest of all I looked at and less bulky. I think I might like this better than the individual hooks I am using now, On the laundry room door. Does this require hardware or does it, simply, fit over the door? BEST ANSWER: Thank you for your question. There is some assembly required, hardware is included. We hope this information will be of help to you.